JUBA – South Sudan President Salva Kiir Mayardit on Monday, March 4 hosted leaders of Ethiopia and Eritrea for high-level talks amid efforts to revive a flagging peace deal struck last year between his government and rebels. 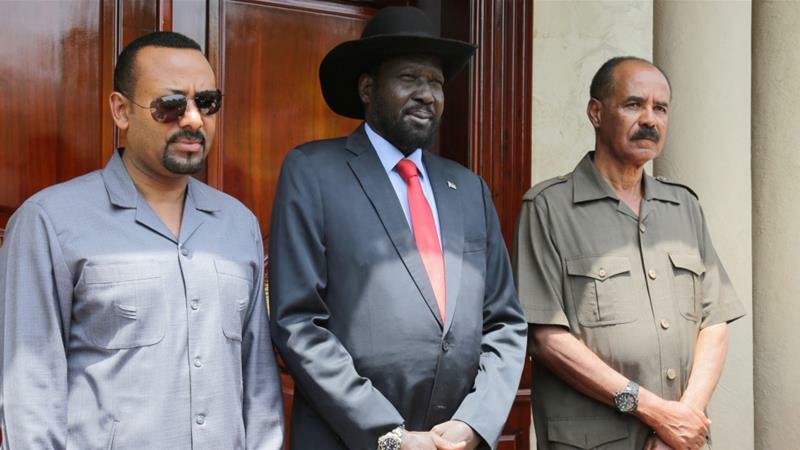 Ethiopian Prime Minister Abiy Ahmed and Eritrean President Isaias Afwerki’s visit came amid increasing warnings that the deal agreed in September 2018 to quell South Sudan’s war was falling apart and all sides were preparing for fresh fighting. “One of the first issues that they discussed was how to bolster the ongoing peace process,” South Sudan’s Foreign Minister Nhial Deng Nhial told journalists. Among other things, the leaders discussed bringing on board groups who rejected the deal signed in Ethiopia’s capital, Addis Ababa, Nhial said. “The government of the Republic of South Sudan has been very supportive of this,” he added. South Sudan broke away from Sudan in 2011 after a long and bloody independence struggle, but just two years later, war broke out again when Kiir accused his former deputy Riek Machar of plotting a coup. A conflict erupted that split the country along ethnic lines. Nearly 400,000 people are estimated to have died and millions have fled their homes, many of them pushed to the brink of starvation. The United Nations has cautioned that tens of thousands face starvation as fighting continues despite the pact. Nhial said ambassador Ismail Wais of the IGAD regional trade block monitoring the peace deal signed by Kiir and Machar, will meet separately with rebel chief Thomas Cirillo and former-army-chief-turned-opposition figure Paul Malong in Addis Ababa and Nairobi on March 8 and 10. Cirillo and Malong both rejected the September deal. Morgan said regional and international bodies have been warning that the peace deal was being slowly implemented and is behind schedule. “Let’s not forget that by the end of May, the pre-transitional period comes to an end and the transitional period should be starting, with Machar, who is currently in Khartoum, returning back to South Sudan to take his seat as vice president,” she said. Eritrea and Ethiopia, themselves still working on healing ties damaged by years of conflict over their shared border, are part of IGAD. Both have established business investments in South Sudan’s hotel industry. Ethiopia is a key contributor to a 4,000-regional armed protection force deployed to prevent further outbreak of war in South Sudan.